Mister Rogers arrives with a piano roll for a player piano. He explains how a piano roll works and talks briefly about how he had to practice regularly to learn to play the piano. At Negri's Music Shop, Joe Negri helps Mister Rogers to demonstrate a player piano before they look inside to see how it works. Before Mister Rogers leaves, Mr. Negri shows a short film about how piano rolls are made. In the Neighborhood of Make-Believe, Lady Aberlin informs King Friday that Corney is thinking about manufacturing miniature Trolleys. As she approaches the factory to talk with Corney, Mr. Gash is singing You Can Manufacture Anything to Corney. X the Owl has been helping to sell Corney's items and arrives with a very large order of items Corney has never made before. Clearly stressed, Corney goes inside to talk with X about this order as Mr. Gash "manufactures" a song for Lady Aberlin -- Lady A. At the Museum-Go-Round, Lady Aberlin sings the song for Lady Elaine as Lady E. Lady Elaine sings it back and then the two sing the song together. Finally, Mr. McFeely arrives with some bad news. Apparently, Corney has been trying to do too much because his latest shipment of rocking chairs has been made with half pretzel parts. Back at the house, Mister Rogers talks about how important and enjoyable it is to do the things you like to do and do them well. Mister Rogers sings Mr. Gash's Lady A song before Mr. McFeely delivers a treat from Chef Brockett -- a piece of cheese and a banana. A note inside instructs Mister Rogers to eat the two together for a snack. Much like the episode where Mister Rogers is clearly eager to play the drums, in this episode we see another example of his excitement to try new things. The player piano at Negri's Music Shop plays music as the user pumps two pedals. 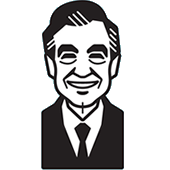 Before Mr. Negri has a chance to fully secure the piano roll and set the piano to play in the right direction, Mister Rogers pumps the pedals causing the piano roll to momentarily flap out of control. Special thanks to: Q.R.S. Music Rolls, Inc.
© 1982 Family Communications, Inc.